Happy new year to you all!! 🙂 Hope you had a great time yesterday. Today I have some excellent news for Amiga fans. A new platform game was released yesterday, just in time for the new year. 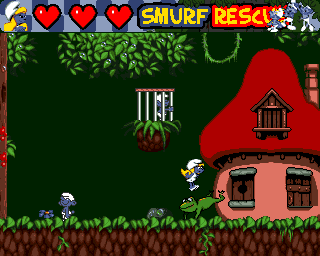 It is called Smurf Rescue and was developed by Mikael Persson (also known as Hipoonios on various Amiga forums). I have yet to try it myself, but as far as I can see from the screenshots it looks very good. Looking forward to giving it a go later on. 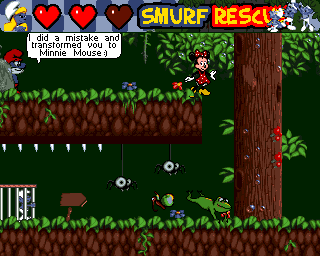 In the game you take control of Smurfette (the female, blonde smurf) and your mission is to save all Smurfs from the evil wizard Gargamel. You must save them all to complete the levels. According to the author the game will run on all Amigas with at least 4MB of RAM. a 68030 CPU or better is highly recommended. To download the ADF-version, please click here. To download the LHA-version, please click here. Looks like fun, doesn’t it? 🙂 If you try it, please let me know your thoughts about it. It sure does. 🙂 Smurfs rocks! I just have this feeling that what Smurfette says would probably get repetitive after a while. I could probably handle it with just the music. I am sure there is a way to turn the voice off (Maybe?). 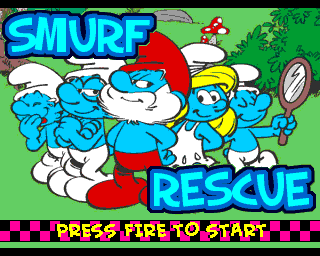 Either way, cool to see the old Smurfs than the CGI ones. Hehe.. 🙂 Yes, it is good to see the good old Smurfs in action!